To celebrate/test the fact that I’ve done some fiddling about on this website and created myself a video header I’ve decided to try it out by uploading a cat video, located above. Apparently that’s what the Internet is all about. I’m here to service those needs. An interpretation of the classic “boy loses girl and laments about it” theme. This music video tells the story of Dancing Cat trying to win back the heart of his lost lover, Bin Cat. This is just a video I made on the fly when we were playing around with a dancing cat toy that dances in time to music input my partner received as a gift back in like 2015 or something. Our cat, Bin Cat, jumped up on the counter and so I filmed her interacting for a bit. For anyone concerned about Bin Cat’s well being, to reassure, I had an idea to create a music video from it about a minute into shooting her on the counter and then quickly filmed the rest of the scenes involving Bin Cat within the minute or two before she wandered off. This was because I didn’t want to unduly stress her. She isn’t afraid of anything, but that doesn’t mean I’ll mistreat her for pleasure. After that I went back and shot some filler shots with the Dancing Cat sans Bin Cat to pad out the narrative where needed. 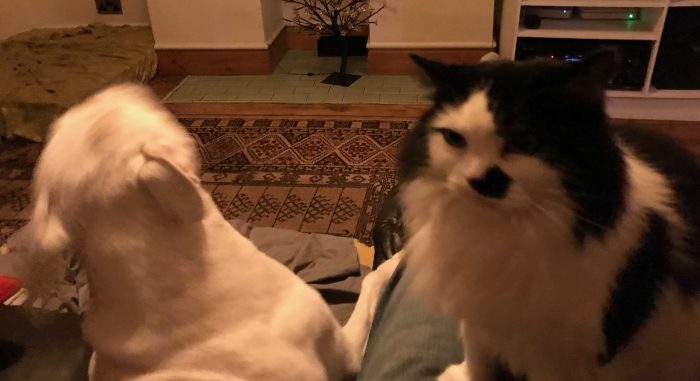 If you needed any further evidence of her being okay, here is a recent picture I sent my partner of her claiming me on my lap and terrifying our Staffordshire Bull, Mr Piggy. Bin Catsy is cool with it all.